NYC, 02/20/2019, 11:15AM. 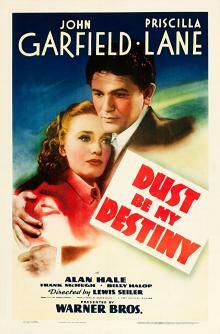 Dust Be My Destiny (1939): Story of an ex-con suspected for murder. An ex-con's luck goes from bad to worse when he falls in love with the warden's daughter, right before he dies, leaving the con as the prime suspect in a murder case. Starring John Garfield, Priscilla Lane, Alan Hale.